Light, as we are becoming, is knowledge. Knowledge is defined by many terms such as awareness, information, data, acquaintance, understanding, realization, comprehension, and the like. Love on the other hand, is without definition. It is what we are. It is the primal “Force” that is everything, and from lifetime to lifetime, it is the breath that gives Love its continued energy, and Light its mastery. Applied knowledge gives you power to control your own force, inside and out. From dimensions well beyond 5D, my Higher Self gave me these words to share with you. “Avoid ignorance, and do not forsake your wisdom. Namaste Loved Ones. From a place of unity consciousness and oneness, as we engage more and more of you who are awakening, the confusion among many is obvious. It is clear to old souls that there is still much disillusionment regarding the nature, the meaning, and the simplicity of Love and Light. Knowing this, we are here to bring awareness to that fact now, so that you can continue your journey with understanding. To say that Love is misunderstood is a gross understatement. Because of darkness, Love is misused, and has been taken so far out of its context that it is even weaponized. Dearest Earth family, Love is what we are. It is the ultimate benevolent force within and outside of us all. It is the air we breathe, and whether positive or negative, the thoughts we hold, and it is never in question because quite simply, Love always Is. 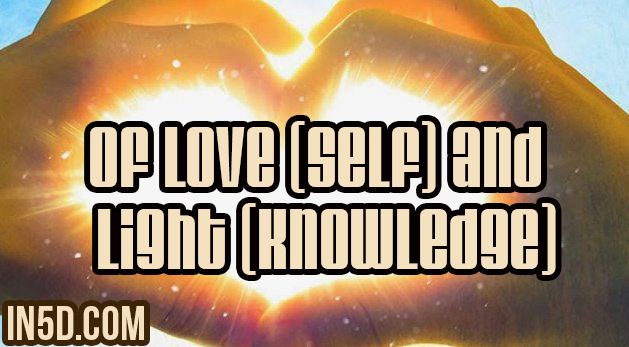 Love is the deciding factor, and your level of Light is revealing how you use your force or power within. This also determines what you reflect and project into your reality. We have established that Light is knowledge. All those behaving in ways that appear unloving simply lack Light. What we want you to grasp and understand is that Love is not a choice, it is what you are. However, the unwillingness to embrace the Light is a choice that we want you to make consciously. To be, and or remain in the dark means only that one’s own unaddressed fear(s) are standing in the way. Because Earth is a school on a free will planet, this is perfectly acceptable. We are here to make sure that you have seen and heard from the Love and Light that surrounds you at all times and are making informed decisions. Knowing is where we’re going, and for Mother Earth and her inhabitants that means that it is no longer possible to remain in dark places as all that was hidden is now being revealed. Darkness, quite simply, is lack of knowledge and ignorance to one’s self. You are who you came to know and remember. All others are here to assist in the process by triggering where lessons in healing will come from. It is the continuous judgements of one another and subsequent abuse due to fear, not of others, but the inadequacies within that darkness has been given a home and kept in place until now. Those on Earth holding Love and Light in higher vibrations are being called out of seclusion, and can no longer avoid the task of sharing by doing the Light work no matter what. With the rapid approach of 2018, and the continuous bombardment of DNA upgrading Light frequencies, it is indeed a choice to either remain unknowing, or face everything and rise. It is our hearts desire that you will Love yourself unconditionally so that you will honestly treat others the way you want to be treated, for loving is our natural state of being. Prepare to know by remembering. Focus your energy upon yourself and what you know you need to heal within yourself. Remember your own power and embrace it. Never again compare yourself to another, because no matter what you’re looking into a mirror, and it serves no one for you to hate your reflection. It helps greatly to realize instead that what you do to others, you do to yourself, and that it is okay for people to disagree with you. Part of the challenge in learning is acceptance. We are not all holding the same vibration, nor are we all in the same stage in our progression and evolution. Nonetheless, as you come to know yourself, you also know others, and with that also comes a natural respect and reverence for the individual journey. Unfortunately, nothing is clearer right now than just how wounded humanity is because of the manner in which our fears are projected upon one another, but I assure you that this is changing before our collective eyes, right now. In closing, I leave you with this: The power to make great change is always yours, and within you. You are divinity and benevolent help is waiting for your call. Know that your every thought and word is heard and that every action is seen and felt. No one has ever been alone, only unknowing of the spiritual and energetic connection to everyone and everything. I send you peace and healing energy. This message is channeled from my Higher Self.